Most lvm implementations support physical storage grouping, logical volume resizing and data migration. Physical storage grouping is a fancy name for grouping multiple block devices (hard disks, but also iSCSI etc) into a logical mass storage device. To enlarge this physical group, block devices (including partitions) can be added at a later time. The size of lvm volumes on this physical group is independent of the individual size of the components. The total size of the group is the limit. One of the nice features of lvm is the logical volume resizing. You can increase the size of an lvm volume, sometimes even without any downtime. Additionally, you can migrate data away from a failing hard disk device, create mirrors and create snapshots. There are some problems when working with hard disks and standard partitions. Consider a system with a small and a large hard disk device, partitioned like this. The first disk (/dev/sda) is partitioned in two, the second disk (/dev/sdb) has two partitions and some empty space. In the example above, consider the options when you want to enlarge the space available for /srv/project42. What can you do ? The solution will always force you to unmount the file system, take a backup of the data, remove and recreate partitions, and then restore the data and remount the file system. Using lvm will create a virtual layer between the mounted file systems and the hardware devices. This virtual layer will allow for an administrator to enlarge a mounted file system in use. When lvm is properly used, then there is no need to unmount the file system to enlarge it. A physical volume is any block device (a disk, a partition, a RAID device or even an iSCSI device). All these devices can become a member of a volume group. The commands used to manage a physical volume start with pv. A volume group is an abstraction layer between block devices and logical volumes. The commands used to manage a volume group start with vg. A logical volume is created in a volume group. Logical volumes that contain a file system can be mounted. The use of logical volumes is similar to the use of partitions and is accomplished with the same standard commands (mkfs, mount, fsck, df, ...). The commands used to manage a logical volume start with lv. 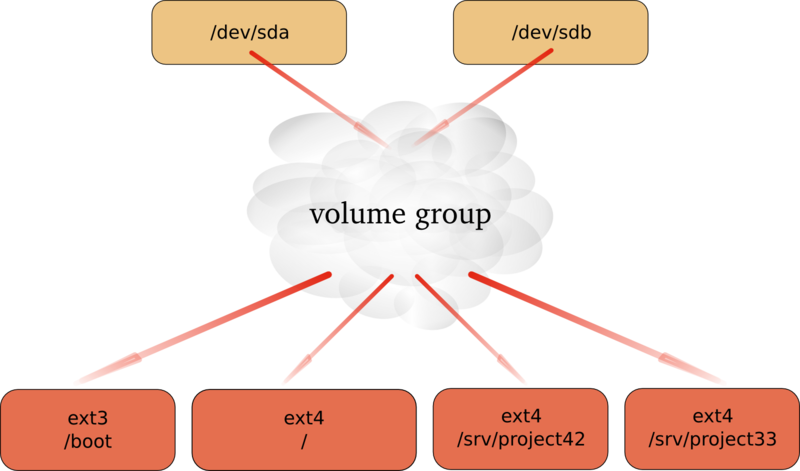 This example shows how you can use a device (in this case /dev/sdc, but it could have been /dev/sdb or any other disk or partition) with lvm, how to create a volume group (vg) and how to create and use a logical volume (vg/lvol0). First thing to do, is create physical volumes that can join the volume group with pvcreate. This command makes a disk or partition available for use in Volume Groups. The screenshot shows how to present the SCSI Disk device to LVM. Note: lvm will work fine when using the complete device, but another operating system on the same computer (or on the same SAN) will not recognize lvm and will mark the block device as being empty! You can avoid this by creating a partition that spans the whole device, then run pvcreate on the partition instead of the disk. Then vgcreate creates a volume group using one device. Note that more devices could be added to the volume group. The last step lvcreate creates a logical volume. The logical volume /dev/vg/lvol0 can now be formatted with ext3, and mounted for normal use. A logical volume is very similar to a partition, it can be formatted with a file system, and can be mounted so users can access it. A logical volume can be extended without unmounting the file system. Whether or not a volume can be extended depends on the file system it uses. Volumes that are mounted as vfat or ext2 cannot be extended, so in the example here we use the ext3 file system. The fdisk command shows us newly added scsi-disks that will serve our lvm volume. This volume will then be extended. First, take a look at these disks. You already know how to partition a disk, below the first disk is partitioned (in one big primary partition), the second disk is left untouched. You also know how to prepare disks for lvm with pvcreate, and how to create a volume group with vgcreate. This example adds both the partitioned disk and the untouched disk to the volume group named vg2. You can use pvdisplay to verify that both the disk and the partition belong to the volume group. And you are familiar both with the lvcreate command to create a small logical volume and the mke2fs command to put ext3 on it. As you see, we end up with a mounted logical volume that according to df is almost 200 megabyte in size. Extending the volume is easy with lvextend. But as you can see, there is a small problem: it appears that df is not able to display the extended volume in its full size. This is because the filesystem is only set for the size of the volume before the extension was added. With lvdisplay however we can see that the volume is indeed extended. To finish the extension, you need resize2fs to span the filesystem over the full size of the logical volume. Performing an on-line resize of /dev/vg2/lvol0 to 307200 (1k) blocks. The filesystem on /dev/vg2/lvol0 is now 307200 blocks long. Congratulations, you just successfully expanded a logical volume. This is a humble demonstration of how to resize a physical Volume with lvm (after you resize it with fdisk). The demonstration starts with a 100MB partition named /dev/sde1. We used fdisk to create it, and to verify the size. Now we can use pvcreate to create the Physical Volume, followed by pvs to verify the creation. The next step is to use fdisk to enlarge the partition (actually deleting it and then recreating /dev/sde1 with more cylinders). When we now use fdisk and pvs to verify the size of the partition and the Physical Volume, then there is a size difference. LVM is still using the old size. Executing pvresize on the Physical Volume will make lvm aware of the size change of the partition. The correct size can be displayed with pvs. We start by creating three physical volumes for lvm. Then we verify the creation and the size with pvs. Three physical disks because lvm uses two disks for the mirror and a third disk for the mirror log! Then we create the Volume Group and verify again with pvs. Notice how the three physical volumes now belong to vg33, and how the size is rounded down (in steps of the extent size, here 4MB). The last step is to create the Logical Volume with lvcreate. Notice the -m 1 switch to create one mirror. Notice also the change in free space in all three Physical Volumes! You can see the copy status of the mirror with lvs. It currently shows a 100 percent copy. A snapshot is a virtual copy of all the data at a point in time on a volume. A snapshot Logical Volume will retain a copy of all changed files of the snapshotted Logical Volume. The example below creates a snapshot of the bigLV Logical Volume. You can see with lvs that the snapshot snapLV is indeed a snapshot of bigLV. Moments after taking the snapshot, there are few changes to bigLV (0.02 percent). But after using bigLV for a while, more changes are done. This means the snapshot volume has to keep more original data (10.22 percent). You can now use regular backup tools (dump, tar, cpio, ...) to take a backup of the snapshot Logical Volume. This backup will contain all data as it existed on bigLV at the time the snapshot was taken. When the backup is done, you can remove the snapshot. To get a list of block devices that can be used with LVM, use lvmdiskscan. The example below uses grep to limit the result to SCSI devices. The easiest way to verify whether devices are known to lvm is with the pvs command. The screenshot below shows that only /dev/sda2 is currently known for use with LVM. It shows that /dev/sda2 is part of Volgroup00 and is almost 16GB in size. It also shows /dev/sdc and /dev/sdd as part of vg33. The device /dev/sdb is knwon to lvm, but not linked to any Volume Group. The pvscan command will scan all disks for existing Physical Volumes. The information is similar to pvs, plus you get a line with total sizes. Use pvdisplay to get more information about physical volumes. You can also use pvdisplay without an argument to display information about all physical (lvm) volumes. Similar to pvs is the use of vgs to display a quick overview of all volume groups. There is only one volume group in the screenshot below, it is named VolGroup00 and is almost 16GB in size. The vgscan command will scan all disks for existing Volume Groups. It will also update the /etc/lvm/.cache file. This file contains a list of all current lvm devices. LVM will run the vgscan automatically at boot-up, so if you add hot swap devices, then you will need to run vgscan to update /etc/lvm/.cache with the new devices. The vgdisplay command will give you more detailed information about a volume group (or about all volume groups if you omit the argument). Use lvs for a quick look at all existing logical volumes. Below you can see two logical volumes named LogVol00 and LogVol01. The lvscan command will scan all disks for existing Logical Volumes. More detailed information about logical volumes is available through the lvdisplay(1) command. Use the pvcreate command to add devices to lvm. This example shows how to add a disk (or hardware RAID device) to lvm. This example shows how to add a partition to lvm. You can also add multiple disks or partitions as target to pvcreate. This example adds three disks to lvm. Use the pvremove command to remove physical volumes from lvm. The devices may not be in use. When you used fdisk to resize a partition on a disk, then you must use pvresize to make lvm recognize the new size of the physical volume that represents this partition. With pvchange you can prevent the allocation of a Physical Volume in a new Volume Group or Logical Volume. This can be useful if you plan to remove a Physical Volume. To revert your previous decision, this example shows you how te re-enable the Physical Volume to allow allocation. With pvmove you can move Logical Volumes from within a Volume Group to another Physical Volume. This must be done before removing a Physical Volume. Use the vgcreate command to create a volume group. You can immediately name all the physical volumes that span the volume group. Use the vgextend command to extend an existing volume group with a physical volume. Use the vgremove command to remove volume groups from lvm. The volume groups may not be in use. Use the vgreduce command to remove a Physical Volume from the Volume Group. The following example adds Physical Volume /dev/sdg to the vg1 Volume Group using vgextend. And then removes it again using vgreduce. Removed "/dev/sdg" from volume group "vg1"
Use the vgchange command to change parameters of a Volume Group. This example shows how to prevent Physical Volumes from being added or removed to the Volume Group vg1. Volume group vg1 is not resizable. You can also use vgchange to change most other properties of a Volume Group. This example changes the maximum number of Logical Volumes and maximum number of Physical Volumes that vg1 can serve. Merging two Volume Groups into one is done with vgmerge. The following example merges vg2 into vg1, keeping all the properties of vg1. Volume group "vg2" successfully merged into "vg1"
Use the lvcreate command to create Logical Volumes in a Volume Group. This example creates an 8GB Logical Volume in Volume Group vg42. As you can see, lvm automatically names the Logical Volume lvol0. The next example creates a 200MB Logical Volume named MyLV in Volume Group vg42. The next example does the same thing, but with different syntax. This example creates a Logical Volume that occupies 10 percent of the Volume Group. This example creates a Logical Volume that occupies 30 percent of the remaining free space in the Volume Group. Use the lvremove command to remove Logical Volumes from a Volume Group. Removing a Logical Volume requires the name of the Volume Group. Removing multiple Logical Volumes will request confirmation for each individual volume. Extending the volume is easy with lvextend. This example extends a 200MB Logical Volume with 100 MB. The next example creates a 100MB Logical Volume, and then extends it to 500MB. This example doubles the size of a Logical Volume. Renaming a Logical Volume is done with lvrename. This example renames extLV to bigLV in the vg42 Volume Group. Renamed "extLV" to "bigLV" in volume group "vg42"
1. Create a volume group that contains a complete disk and a partition on another disk. 2. Create two logical volumes (a small one and a bigger one) in this volumegroup. Format them wih ext3, mount them and copy some files to them. 3. Verify usage with fdisk, mount, pvs, vgs, lvs, pvdisplay, vgdisplay, lvdisplay and df. Does fdisk give you any information about lvm? 4. Enlarge the small logical volume by 50 percent, and verify your work! 5. Take a look at other commands that start with vg* , pv* or lv*. 6. Create a mirror and a striped Logical Volume. 7. Convert a linear logical volume to a mirror. 8. Convert a mirror logical volume to a linear. 9. Create a snapshot of a Logical Volume, take a backup of the snapshot. Then delete some files on the Logical Volume, then restore your backup. 10. Move your volume group to another disk (keep the Logical Volumes mounted). 11. If time permits, split a Volume Group with vgsplit, then merge it again with vgmerge. I choose /dev/sdb and /dev/sdc for now. Building a new DOS disklabel with disk identifier 0x94c0e5d5. The mounting and copying of files. Run all those commands (only two are shown below), then answer 'no'. Performing an on-line resize of /dev/mapper/VG42-LVsmall to 307200 (1k) blocks. The filesystem on /dev/mapper/VG42-LVsmall is now 307200 blocks long.